We seem to be having a summer in the UK. Not just sunshine, but actual heat… It’s pretty much unheard of in June. But as someone who adores summer, you’ll get no complaining from me: I break out the summer wardrobe and rejoice! This outfit was worn just before it got hot hot (it’s about 29°C today*), so I actually think I’d be too hot in my striped maxi skirt and tucked-in top this week. However I wore it out in the evening, and although here it usually gets colder at night and you need a light jacket or a cardigan, we’re now getting the balmy evenings too which is a godsend. I bought the skirt a couple of years ago at Marks & Spencer and although I’ve expanded a little(!) since then, it still fits fine because of the jersey material. Being black and white would mean it’s easy to style, but I get confused by black, or black and white…. Give me bold colour any day! I decided to play it simple and went for black and white with a pop of colour. I pretty much kept everything black or white except for those fab Asos SS16 espadrilles (similar) – I’m sooo excited It’s the right weather to wear them again. They were last seen in September last year, when I used them as part of a bright accessories story: I guess that’s what I’m doing with them here too. It’s the accessories that really make this outfit. The skirt and top are pretty basic, but add in a funky bag and shoes and then the pièce(s) de résistance – the pearl-effect sunglasses and pearl hoop earrings, and you are SORTED. 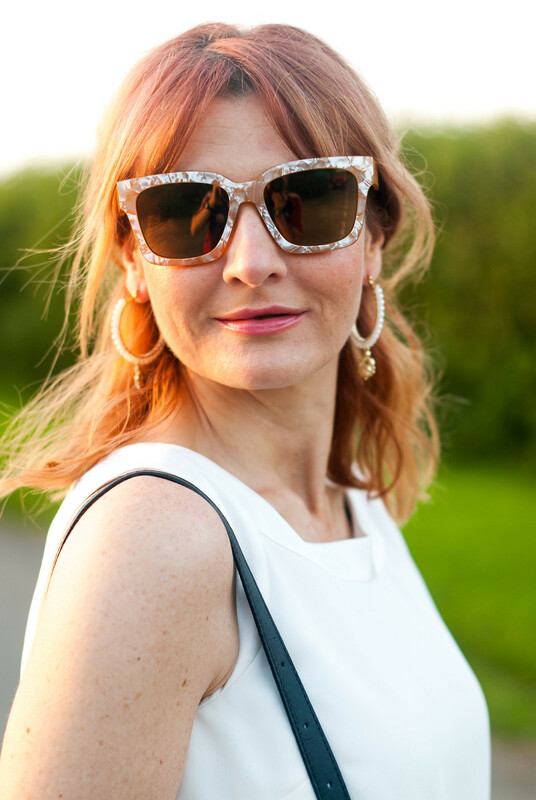 I’ve become quite attached to these sunglasses lately and really not keen on wearing any others (see how they look with a wedding guest-worthy dress here). If you want to see more statement sunnies like these then head over to last week’s shopping post where I picked out 60 cooler-than-average statement sunglasses for you (you’re welcome ). Finally… You know when you can match your outfits to your surroundings? Well, I matched my outfit to the local wildlife. You’ll see what I mean when you scroll down to the last two pictures… clever, eh?! WHAT ARE YOU WEARING IN THE HEAT (AND DO YOU HAVE ANY ALTERNATIVE EXPRESSIONS FOR “POP OF COLOUR”)? COMMENT BELOW, OR TAKE IT TO TWITTER @NOTLAMB! *I do know that 29°C (84°F) isn’t anywhere near as hot as some countries’ temperatures, but in the UK it’s a humid heat and we generally don’t have air con except in newer cars, city centre shops and large corporate offices. I worked in a south-facing office with floor-to-ceiling windows for 11 years that didn’t have air con. It was HORRIFICALLY hot in the summer….! Next Post Why Are So Many Fashion Brands Going Out of Business? Catherine, thank you so much for including Style Crone as one of your favorite "outfits from last week." Your weekly linkup is always a highlight of my blog life. Thank you for hosting. This looks beautiful. 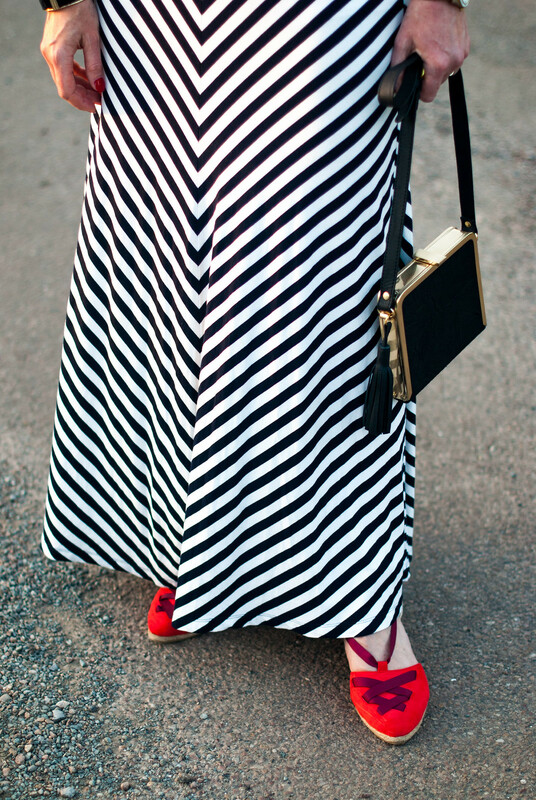 I love the striped skirt and those shoes are a gorgeous pop of red. Nicely done! Black and white is always a great colour combination for an outfit – no matter the season! The bright red shoes are an excellent contrast and statement piece too! The choice of a cuff and diamond-style hoop earrings are perfect accessory pieces that help to compliment the outfit. I agree Catherine…. A "pop" starts to feel contrived and old-fashioned. It's like being "on-trend", "making it your own" or "nodding"…. we need some new and fresh phrases. A blast of colour? Accents? Contrasts? Such a classic and wearable outfit Catherine! And I love all of the skirts you linked! Enjoy the beautiful weather. Oh we got 105 F right now. But I'd much rather have just about 29. Thank you very much. 🙂 You got quite the Brit chick charme here Catherine. Fabulous and cool. Right out of a magazine!!! Such a fabulous look! I love the bag! I also love the pictures of the cows behind you. How fun! I ll join you in black and white! Love the black and white and your sunglasses! I especially love the photo with the cows, so coordinated. I adore black & white looks!!!! This skirt is amazing! Love how you kept it simple with just a little pop of color in the shoes! Good luck dealing with the June heat! Oooh, I love that skirt. I saw one in my local thrift and almost grabbed it before stepping away with caution. Love the red with the outfit. That sounds very hot. Here it was 12C yesterday morning, an unseasonable cold winter and spring. But it's warming up slooowly. Love the matchy with the cows. Fighting words seem to be popular to describe the colour accents – punch, kick. Jab? Knockout is often used to describe a whole outfit. ???!!! I love how you styled your black and with with color accents! Black and white is my total comfort zone, and I am always looking for ways to spice it up a bit! We are in a big heat wave out in California, so I have been wearing anything that will not "stick" to me. Loose dresses like I linked up today or maxi/midi skirts and tanks. Your sunnies are fab, I'm headed over to last weeks post to check out your links! I was curious to read the comments and see the reactions to your quest for an alternative phrase for "pop of color". I hadn't given much thought to its overuse but you got me thinking now. I'll let you know if I come up with something . Espadrilles are my favourites at the moment. I have not been out of mine! As for words? Mmmm will have to think about that one! I am so glad that you are having a nice summer now, so hopefully it will be nice and cool in August, when it really sorching here. If you would have lived one of our summers you wouldn´t like it that much I tell you, ahhhhhhhhhhhhhhhh ahhahahah. Looking fab, but yes too hot now for tucking anything in! 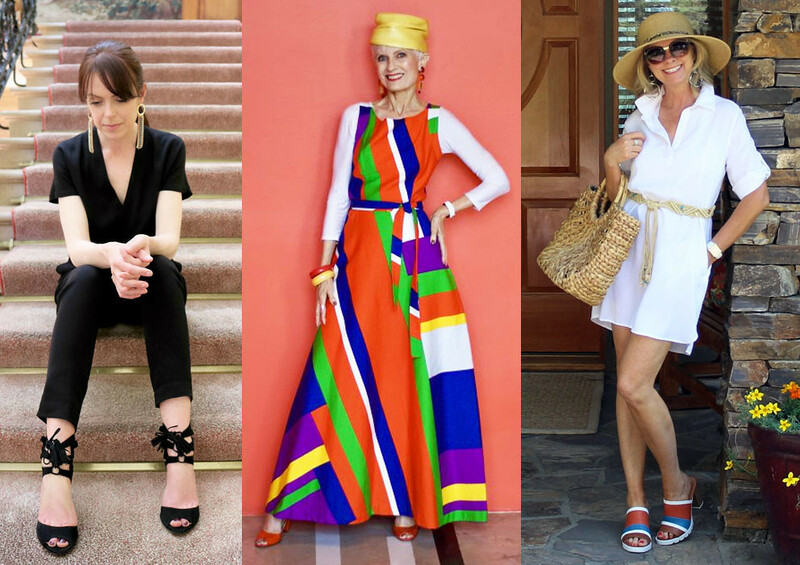 Fashion expressions that I despise: Elevate, Pop of Color, Curate… etc. Love you with the chorus of cows! Perhaps a little splash of colour, or a little peep of colour or a little drop of colour? Oh my goodness now you have me, I will be up all night thinking of these! I love that skirt and of course the pop of color in the shoes is perfection! I am glad you are getting heat! We are still waiting for it here. I think this week it is supposed to warm up some. Thanks for the shout out feature! That is so fun! Peace! I love that you included the cows in your photos, Catherine since they are wearing black & white too!!! I always use that term pop of color too!! I think it's been imbedded in my brain since What Not to Wear! ha ha! !